Whilst no specific program will be organized for accompanying persons, the Clarion Congress Hotel Concièrge or the local tourist office offer a very wide range of tours, visits, excursions and activities. Accompanying Persons are therefore encouraged to make use of these facilities, and to plan their own schedule. The Clarion Congress Hotel is about 15 minutes' subway ride from the city center. Accompanying persons are welcome to attend the Receptions on the Wednesday and Thursday evenings, and are also welcome to participate in the visit to the Strahov Library and Pilsner Brewery. We kindly ask you to let us know if your accompanying person will attend the Receptions and the visits (on your registration form). Prague Ruzyně Airport offers direct flights to many countries worldwide. The Clarion Congress Hotel is about 19.5 km from the Airport and it takes about 30-45 min by taxi (19.5 km/ 12 miles). The hotel can offer its hotel taxi at the rate of 850 CZK. For reservation please contact hotel concierge (E-Mail, Tel. + 420 211 131 124) or reservation dept. (E-Mail, Tel. + 420 211 131 119). Transport from Main Railway Station by taxi takes about 15 min. (6.5 km). The hotel can offer its hotel taxi at the rate of 370 CZK. Transport from Holesovice Railway Station by taxi takes about 15 min. (6 km). The hotel can offer its hotel taxi at the rate of 400 CZK. The city of Prague experiences a continental climate with warm summers and relatively cold winters. Most rain falls during the summer. The temperature difference between summer and winter is relatively high, due to the landlocked geographical position. During October, temperatures usually fall below 15 °C (59 °F) or 10 °C (50 °F) and deciduous trees begin to shed their leaves. The currency is the Czech crown (CZK, Kč). Visitors can change foreign currency at banks, bureaux de change or at most hotels. The easiest currencies to exchange are Euros, US Dollars and Pounds Sterling. Travellers Cheques are widely accepted, and many hotels, travel agencies, and restaurants accept all the major credit cards. Most banks are equipped to advance cash on credit cards. There are no restrictions on the amount of foreign currency that can be brought into the Czech Republic. The electricity supply in the Czech Republic is 230 V, 50 Hz. 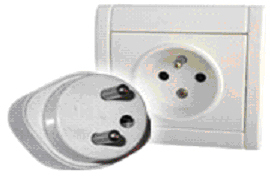 The Type E socket standard in most of EU countries is used. The Type E electrical plug is identified by two round pins spaced 19 mm apart, with a hole for the socket's male grounding pin. Type E outlets will also accept Type C plugs, and Type E plugs will also work in Type F outlets. There will be free internet access in the Clarion Congress Hotel lobby and in all guest rooms, and some PCs with internet access will be available in the meeting room. Vouchers for Wi-Fi access will be available at the hotel reception (a 24 hour voucher costs 350,- CZK). No free Wi-Fi access will be provided at the meeting room. Lunch will be served on Monday, Wednesday, Thursday and Friday. Morning refreshments will be served Monday through Friday, and afternoon refreshments will be served Monday through Wednesday. On Wednesday 12 October - OIML Reception (Business dress code). The Reception will take place at the Strahov Library, and will be preceded by a short tour of the Library. The Library is located about 20 minutes drive from the hotel; a bus service will be provided. On Thursday 13 October - Czech Government Reception (Smart casual dress code). Following a guided tour of the Pilsner Brewery, located about 90 minutes from the hotel by bus, Delegates are cordially invited to attend the Czech Government Reception which will take place in the brewery. Delegates are advised to bring a jacket or coat (the temperature is about 6 °C in the brewery cellar) and to wear flat shoes since the floor can be slippery. The bus will make one return trip, therefore Delegates wishing to attend the reception should also attend the brewery tour. Prague standard time is UTC + 1 hour (Daylight saving time: +1 hour). Local time, and various other information concerning Prague (and indeed all other cities in the world) can be found at the World Time and Date web site. Tipping is not mandatory in the Czech Republic, although guides, drivers, waiters and hotel staff can be tipped at your discretion if you feel the level of service provided warrants a tip. Generally 10 % is the amount given as a tip for example to taxi drivers and waiters/waitresses.